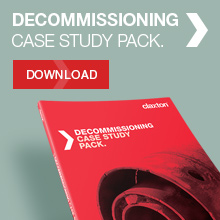 Claxton cold cutting equipment is widely used in decommissioning, wellhead installation and in tieback operations. Flexibility is always a key requirement for offshore applications and our cold cutting systems can be adjusted on request to suit numerous applications. Our machines are air-driven, which makes them suitable for use in hazardous environments – making the system flexible to use for many on- and offshore cold cutting operations. Multiple supply options are available – either tooling rental, tooling and personnel or full cutting and recovery packages for larger projects or to overcome operating challenges. Claxton can also provide a suite of tooling compatible with its cold cutting machines to enable on-site machining services including; skimming of casings, flange facing and cutting of API / ANSI ring type seal profiles. This capability – and experience – is further enhanced by our fleet of cutting tools and services which include full casing and conductor cutting and recovery packages with multiple surface and subsea cutting options.